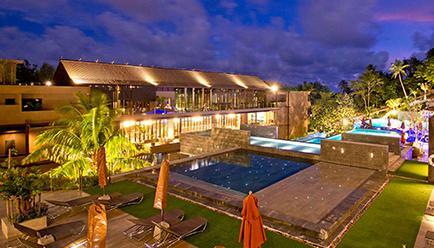 Sunsuri Phuket is a dream come true for those who are looking to relax and escape from city life. 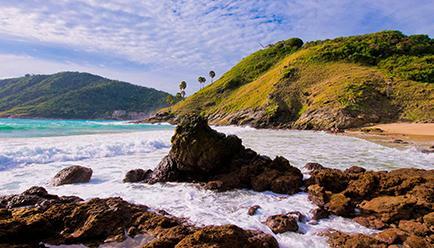 Located in an undisturbed area on the South West coast, it is just a few minutes away from Nai Harn beach, recognised as one of the best beaches in Phuket. Bicycle around the Nai Harn lake and the hills beyond as the fresh air soothes you. 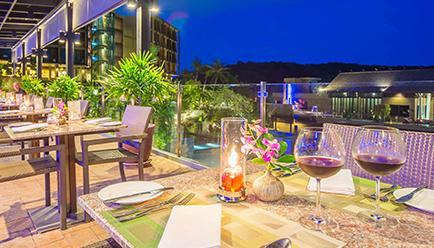 Sunsuri Phuket is located just 500 metres from the award winning Nai Harn Beach on the less-travelled southern coast of Phuket. 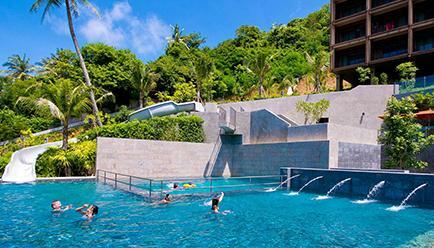 Sunsuri is Phuket’s best kept secret surrounded by spectacular unspoiled nature. This resort offers breathtaking panoramic views from its tropical hillside position that will lift your spirits and set your mind free. 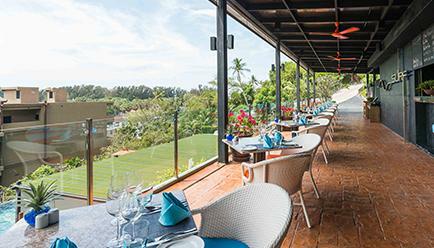 Sunsuri Phuket is perched on a picturesque hillside with spectacular views of the ocean, lake, billowing trees and hillsides. 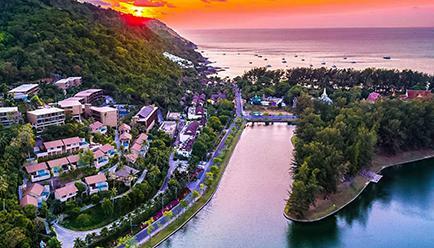 The resort is located in an undisturbed area on the South West coast, a few minutes away from Nai Harn beach, recognised as one of the best beaches in Phuket. Just a 40-minute drive from Phuket Old Town and away from the hustle and bustle of Patong 30 minutes north, relaxation is the central theme of the resort. Just a 90-minute drive from the airport, Sunsuri Phuket is dreamboat for those who enjoy secluded beaches and the quiet company of nature. 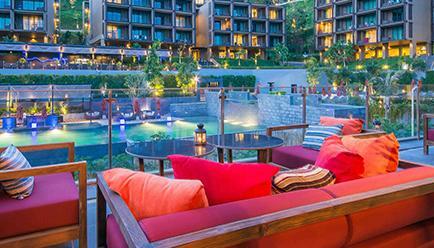 At Sunsuri Phuket the contemporary Asian design is cutting edge and modern yet offers a warm ambience that is exceptionally welcoming. 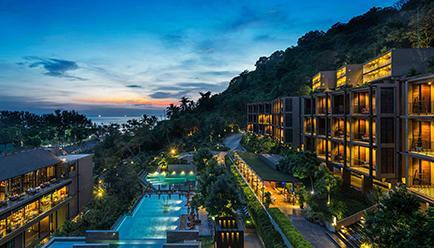 The stylish guestrooms with huge balconies and breathtaking views make it one of the most romantic hotels in Phuket. Enjoy each day with a brand new experience from cycling around the scenic lake to indulging in relaxing spa treatments or just take it easy by one of the relaxing swimming pools. Those looking for a lazy day by the beach, lazing around the pool and creating awe-inspiring moments will revel at the resort. For the foodie in you, their two all-day restaurants as well as a chic bar that serves tapas, speciality drinks and imported wine, will feed your culinary delights. 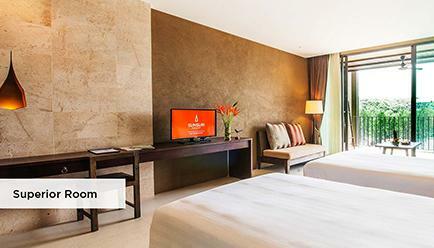 The accommodation is equally appealing, with all 133 rooms seamlessly blending classic and contemporary design elements. 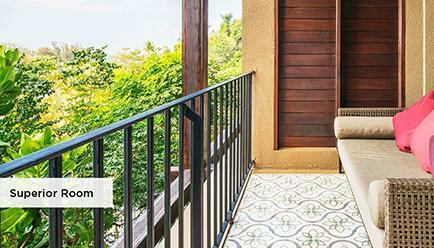 Expect Thai aesthetics, soothing earthy tones, spotless bathrooms with rainshowers, and Nai Harn Lake and the Andaman Sea views from private balconies. Thoughtful extra additions include include over-size beds, LED interactive TVs and filter coffee machines. With spacious and luxurious accommodation with modern facilities for couples, honeymooners and families. 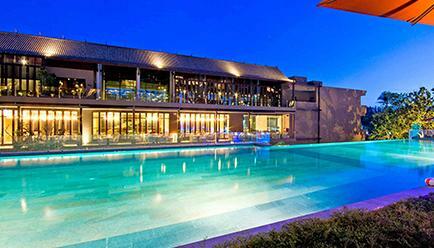 Meeting and event venues are designed to serve business, wedding or any other party purposes. 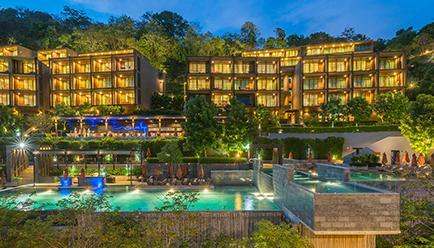 The Sunsuri resort in Nai Harn offers a choice of spacious rooms, suites and pool villas. With a swift buggy ride you will be escorted to your room passing butterflies and blooming tropical plants and the familiar aroma of pandanas. 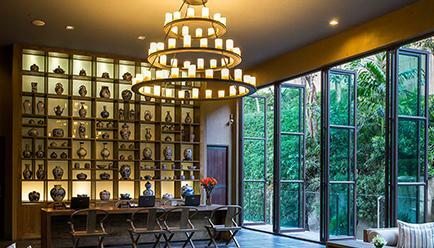 The contemporary rooms are elegantly Asian with soft muted colors and refined décor and all of the modern day delights you seek at a luxury retreat. Superior Room - 45 sq.m. The Superior room’s large balcony overlooks the tranquil Nai Harn Lake filling the room with lush green views of nature and a calming mood. The designer décor is understated and cool, the furnishings are custom made and luxury is introduced into many room details from natural soaps to soft bathrobes. 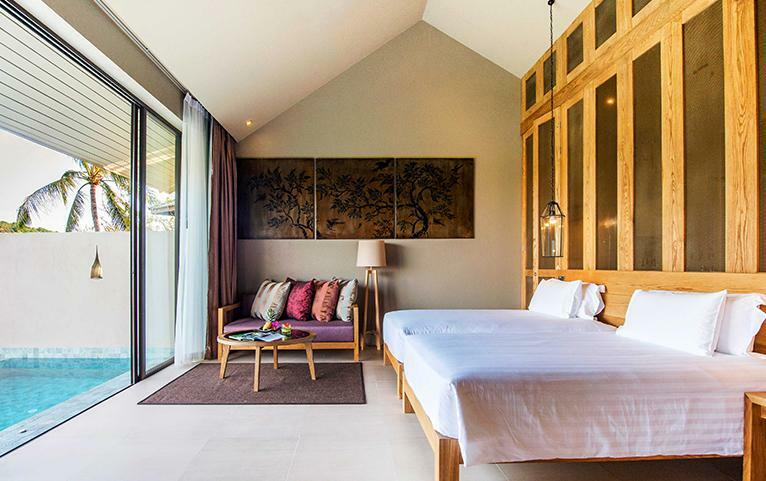 Spend time relaxing in the comforts of this peaceful Nai Harn hotel room, help yourself to great tasting coffee, watch a movie or simply sit back and admire the heavenly view. Grand View Pool Villa - 110 sq.m. The pool villas are positioned to enjoy fantastic panoramic views of lush green nature and wide open blue skies. Take a dip in your private 4x6 m. pool with Jacuzzi jets and sunbathe on the spacious deck with amazing mountain and lake landscapes as a backdrop. The 210 sq. 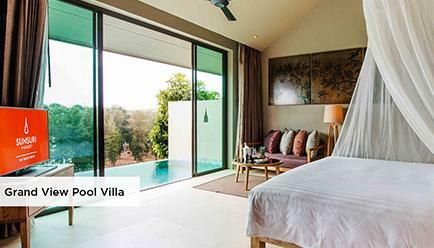 m. pool villa in Nai Harn is designed with natural wood furnishings and cool calming tones and features a spacious dressing area where a range of luxury amenities and refreshments can be found. The bathroom is a great place to relax featuring a deep bathtub with a gorgeous view! Imagine a bathtub with a view of the Nai Harn lake and the hills beyond. Just that would make the resort an unforgettable place. Relax as the water relieves all your tension away and the awe-inspiring view to look at. Surcharge: No high-season surcharges apply for this deal, so that you can enjoy the insider prices across the travel period! Extra Guest Policy: One adult (aged 12 or above) may stay at a surcharge of 1200 THB per night, with an extra bed and the inclusions available in the package, payable directly at the resort. Child Policy: One child below 12 yrs of age stays complimentary with a sofa bed and breakfast for Superior Room category only. A child (aged between 0-3 years) stays free of charge. 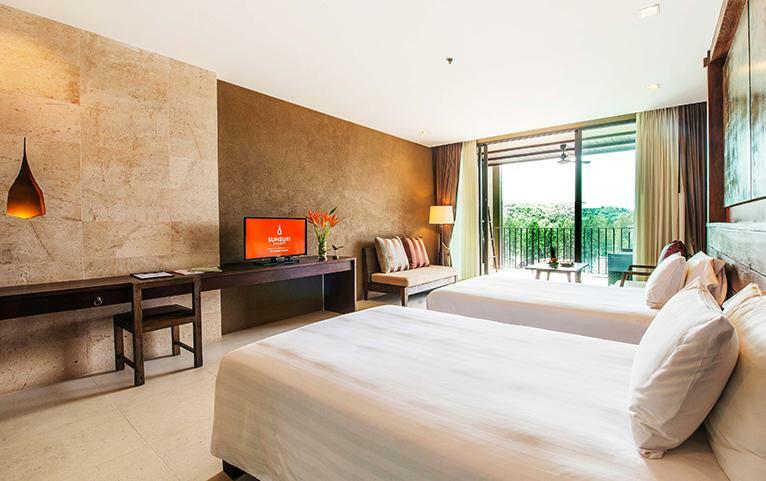 Where applicable, a child (aged between 4 to 11) can stay at a surcharge of 600 THB per night, with an extra bed and the inclusions available in the package, payable directly at the resort. Bicycles: Sunsuri Phuket offers free bicycle rental for guests for 2 hours. Guests can enjoy a slow ride on Nai Harn lake or bike to local restaurants, shops, and beaches. Soothe Spa: Soothe Spa therapies embrace the most effective Asian and European styles of massages including both Thai and Indian techniques. Their practitioners of health and healings induce a sense of well-being and specialise in Ayurvedic healing and aromatherapy. Coupled with southern aromatic oils to loosen tight muscles and improve circulation, the techniques are known to facilitate the soothing of mind and spirit and exude comfortability. 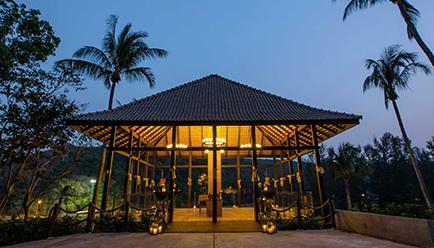 With 28 choices of different styles & techniques, from Traditional Thai oil massages to full body scrubs with coffee and honey, they have it all. Surf Pool Bar and Restaurants: Feel the breeze and enjoy the tropical pool views at the Surf Restaurant open for lunch and snacks throughout the day. 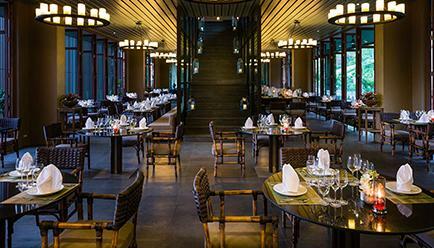 Bite into their succulent signature burger, sample famous local dishes such as Phad Thai noodles or keep it super healthy with a fresh seasonal salad and watch the chefs at work in the open kitchen. Pool lovers can order drinks and snacks from the pool bar right alongside the water and enjoy the cool tunes and a happy holiday vibe while sipping delicious healthy shakes or something a little stronger. Sip Bar: The stylish Sip Bar opens during the evening for drinks, entertainment and light bites. Fall into the big soft sofas on the balcony under the stars or in the exotic Asian styled interiors and choose from a wide variety of fine wines, cocktails, whiskeys, draft beers and more. They regularly screen movies and sports events on the large screen and offer complimentary games. Sandbox Kids’ Club and Games Room: Step into the Kids Club Sandbox zone where children over five years old are free to play under the supervision of experienced staff. The Kids Club features many quality toys to enjoy and several board games to play such as Monopoly, Uno cards and much more! Older children can enjoy the trendy game room equipped with the latest video game console such as the Wii or PlayStation with a wide selection of games. There are various daily activities from 9:30 a.m. until 5:30 p.m. in the afternoon scheduled every day. While most activities are free to join, some activities require a small fee to participate such as Kids Pizza Making class or Batik Painting classes. 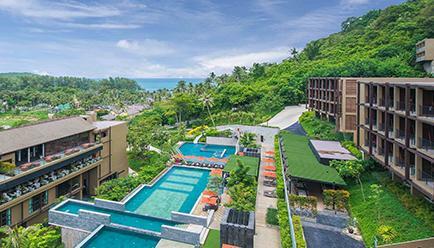 Sunsuri Phuket is 90 minutes’ drive away from Phuket International Airport. You can easily get a flight from metro cities in India to Bangkok. From Bangkok, you can take a flight to Phuket International Airport.